We regret to have to inform Members that Nick Syrett passed away on Boxing Day at the age of 84 after a brave battle with cancer. He had been an Associate Member of the BRDC since 1967. Born within earshot of Brooklands, Nick was the nephew of Bentley Boy Bertie Kensington-Moir. After National service in the Royal Air Force, Nick joined the RAC’s travel department where he dealt with the numerous British drivers needing customs carnets to race their cars overseas. 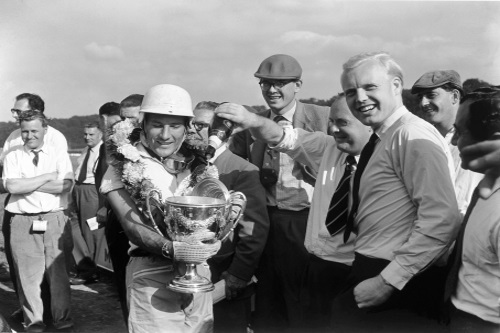 Amongst others he became a close friend and confidant of Mike Hawthorn, the first British World Champion. In 1957 Nick moved to the British Racing and Sports Car Club, initially as Club Secretary. He will be remembered by Members of a certain age as ‘the Guv’nor’ who, as Executive Director of the BRSCC, acted as Clerk of the Course at many race meetings, from major international events to club racing, through the 1960s. Brands Hatch was the BRSCC’s home and, together with John Webb, Nick led the growth of both the circuit and the club to a pre-eminent position in British motor sport. The Brands Hatch Grand Prix circuit opened for Formula 1 business in 1960, the first British Grand Prix at Brands Hatch following in 1964 with the Race of Champions becoming one of the principal non-championship F1 races from 1965. In 1967 came the first World Sports Car championship event, the BOAC 500, the 1970 running of which has gone down in history as the race in which Nick black-flagged Pedro Rodriguez early on for overtaking under yellow flags, giving him a severe rebuke at the end of the pit lane before sending the little Mexican on his way to one of his greatest victories in the Porsche 917. With John Webb, Nick was also instrumental in facilitating the introduction of the spectacular Formula 5000 into the UK and Europe in 1969 whilst at a lower level the Clubmen’s Formula from 1965 and Formula Ford from 1967 were both conceived and catered for by Webby and the Guv’nor from the beginning. In 1972, following the death of Jo Bonnier in the Le Mans 24 Hours, Nick was invited by Jackie Stewart, JoBo’s successor as President of the Grand Prix Drivers’ Association, to become the GPDA’s Secretary. Later he ran a restaurant before, in 1982, taking on the management of the Winchester House Club, a gentlemen’s club in Putney where he remained for 35 years. He also retained a lifelong interest in cricket, continuing to umpire matches until earlier in 2017. The BRDC offers its sincere condolences to Nick’s many friends both within the Club’s membership and the wider world. Nick's funeral will be held at 10.45am on Friday 26 January at East Chapel, Putney Vale Crematorium, Stag Lane, Putney SW15 3DZ followed by a wake at The Winchester House Club, 10 Lower Richmond Road, Putney SW15 1JN. If you would like to attend, please contact Sarah Thomas from the Secretariat of the Winchester House Club either by email to secretary@winchesterhouseclub.com or by calling 0208 785 6657. No flowers please, but donations if desired to Cancer Research UK or the BRDC Motor Sport Charity.